Omarosa Manigault Newman, then White House Director of Communications for the Office of Public Liaison, sits behind President Trump. 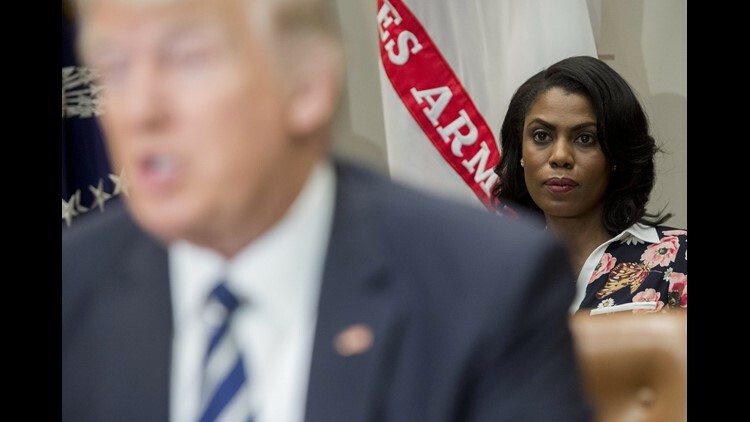 WASHINGTON – Former White House aide Omarosa Manigault Newman said Sunday that she was “complicit” in White House efforts to deceive the nation and was used by President Donald Trump. “I was like the frog in the hot water,” she said on NBC’s "Meet the Press." "You don’t know that you’re in that situation until it just keeps bubbling and bubbling." Manigault Newman, who first met Trump when she appeared on "The Apprentice" more than a decade ago, was a high-profile defender of him throughout the presidential campaign in 2016 and during her tenure in the White House last year. But the former reality TV star is coming out with a tell-all book, “Unhinged: An Insider’s Account of the Trump White House,” in which she calls the president “racist” and says he has suffered "mental decline." Trump on Saturday called Manigault Newman a "lowlife." On Sunday, Kellyanne Conway said the former reality TV star was just trying to make money. In the White House, Manigault Newman was director of communications for the office of public liaison until Chief of Staff John Kelly fired her in December. She recorded the conversation and provided the audio to "Meet The Press." In it, Kelly told Manigault Newman it was time for her to leave the White House because of “significant integrity issues” related to "use of government vehicles and some other issues," which he didn’t detail. “I think it’s important to understand that if we make this a friendly departure, we can all be, you know, you could look at your time here in the White House as a year of service to the nation, and you can go on without any type of difficulty in the future relative to your reputation,” he said. Manigault Newman said she took that as a threat. She later declined an offer to work on Trump’s 2020 campaign and did not sign a confidentiality agreement. Omarosa Manigault Newman, 43, former White House Director of Communications for the Office of Public Liaison, left her White House job this week under disputed circumstances. She says she was not escorted from the premises after a difficult discussion with Chief of Staff John Kelly. The former reality TV personality was a contestant on Donald Trump's show 'The Apprentice' in 2004. In this July 25, 2017 file photo, Omarosa Manigault, adviser to President Donald Trump, arrives for a Make America Great Again rally at the Covelli Centre in Youngstown, Ohio. Her position as director of communications for the White House Office of Public Liaison ends effective January 20. When Chief of Staff John Kelly took the helm in the White House Manigault, Manigault-Newman's ability to reach the President directly was greatly curtailed. Part of her role was to be a liaison between the White House and the black community. President Donald Trump (R) is joined by Vice President Mike Pence, White House Director of Communications for the Office of Public Engagement and Intergovernmental Affairs Omarosa Manigault (L) and other staff members during a meeting with the Congressional Black Caucus Executive Committee at the White House. During the 2016 presidential campaign, Trump asked African Americans to support him, saying, "You're living in poverty, your schools are no good, you have no jobs, 58 percent of your youth is unemployed -- what the hell do you have to lose?" Donald Trump does the standard presidential dance, kissing a baby at Greater Faith Ministries International in Detroit, as Omarosa, the campaign's director of African-American outreach, looks on. Counselor to the President Kellyanne Conway left, and Director of Communications for the Office of Public Liaison Omarosa Manigault, 2nd left, and White House communications director Mike Dubke, right, listen as a reporter asks a question during a joint press conference in the East Room of the White House. Omarosa Manigault, speaks with reporters during the Cocktails and Convention reception hosted by the Black Republican Caucus of Florida, in Cleveland, OH. She does not enjoy great support in the black community. While the dramatic in-your-face competitor was eventually fired in Donald Trump's reality show, the two hit it off and she has remained extremely loyal to Trump. Omarosa speaks to the media to show her support for Republican presidential candidate Donald Trump after he wins the New York Primary at Trump Towers in Manhattan on April 19, 2016. Omarosa Manigault strikes her pose at the 47th NAACP Image Awards on Febr. 5, 2016 in Pasadena, Calif.
Omarosa makes an entrance on the red carpet for the Emmy Awards at the Shrine Auditorium in Los Angeles. She made such an impact on Trump's show she's famous enough to go by her first name only. You've made it when you become a character on 'Saturday Night Live.' Fired 'Apprentice' candidate Omarosa, portrayed by Maya Rudolph, is repeatedly struck in the head by falling objects (culminating in a sidewalk garbage can) when she visits Saturday Night Live's "Weekend Update" with Tina Fey (left) and Jimmy Fallon (right). Omarosa Manigault-Stallworth from Washington, DC is pictured on 'The Apprentice.' She played an unabashed villain in the show. This is a frame grab from the television show "'The Apprentice.' Left to right are Ereka Vetrini marketing manager and Omarosa Manigault-Stallworth, during the show. The female contestants from NBC's new reality show 'The Apprentice,' appear in this undated publicity photo. Jessie Conners, left, Katrina Campins, Eveka Vetrini, Omarosa Manigaul-Stallworth, Heidi Bressler, Kristi Frank, Amelia Henry, and Tammy Lee.